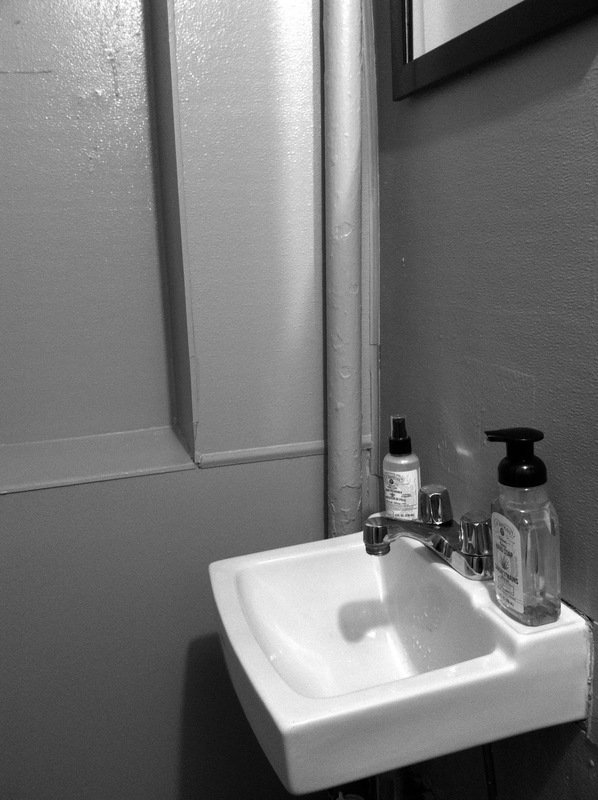 Late last week, after nearly a month of painting, I found myself alone in the very tiny (nearly miniature, in fact) bathroom of the 2nd Avenue shop, faced with the final four walls in need of some Benjamin Moore-approved TLC. Space-wise, it really should have been the easiest room to paint. 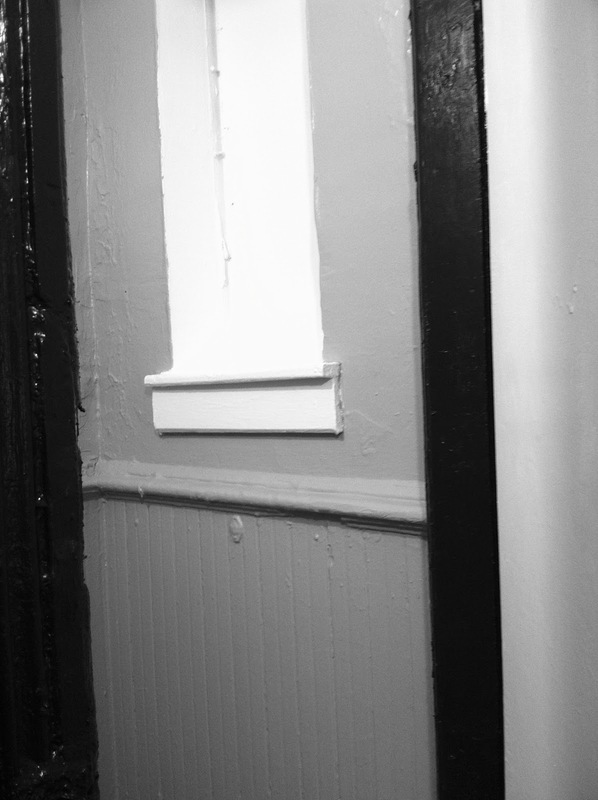 However, unlike the rest of the shop, which has received new layers of dry wall in recent years, the bathroom walls in our pre-war building have not been replaced (or, it seems, sanded) in nearly a hundred years. Back in January, when we began the search for permanent locations, we narrowed the hunt down to two spaces that matched our specific needs. One was a really beautiful, newly constructed space in a brand spanking new building. The minute I saw it, I wanted it. Think of how easy it would be to move into a fresh space, one that had never been touched or cooked in, its pipes still wrapped in cellophane, its flooring still free from hairline cracks. What a luxury! But during the final hour of negotiations, we began to feel ourselves being pulled to the second space: a charming shop on the ground level of a pre-war building, complete with fifteen-foot walls, tin tiles on the ceiling, and a walk-up basement entrance on the street. When standing inside the new shop, it is easy to forget the building's age. There is new drywall in the dining room and kitchen, all of which has been coated with clean layers of fresh paint, new tiling on the floors, and a relatively updated facade. It wasn't until I stood in the bathroom -- that most private of spaces -- and began to run my painter's tape across the ceiling that I was truly confronted with the history of the place. The bathroom walls are ripe with imperfections. There are multiple dents spread across them, places where it looks as though the wall began to cave in but gave up after only an inch; the antique molding is chipped and, on one wall, is entirely gone (where did it go exactly? did a previous occupant begin to tear it down and forget about the remaining pieces?). Nearly as soon as my roller touched the wall, it was clear that this room would become the white whale of my renovation experience. The walls acted like sponges, instantly absorbing every stroke of color, forcing me to apply layer upon layer on the same sad patch. A few weeks earlier, the chef had tried to remove at least a few layers of the paint using some pretty crazy chemicals and fancy equipment (recall my experiences with a paint eater? ), but without much success. Shortly thereafter, the chef gave up and I gave in (we are not leaving the bathroom covered in a patchwork of paint...I'll deal with this mess myself athankyou). So there I was, my proverbial foot in my mouth, as I tried in vain to apply my decorative touches. Frustrated, and determined to get a better sense of what, specifically, was standing in my way, I picked up a screwdriver and began to scrape away some of the paint on one of the remaining pieces of molding. Truthfully, I didn't expect to find anything particularly mind blowing. But as I continued to chip away at my project, what I somewhat accidentally discovered were the many stories quite literally hidden in those walls. With every movement of my hand, more and more layers of previously hidden colors were revealed. There were rings of burnt oranges and bold reds painted by more recent tenants, followed by calming blues, a coppery hue, a faint ring of green and a thin band of white that was likely applied when the building was still considered new. As all the colors were revealed, I couldn't help but wonder about the many individuals who came to this address before us -- all those other dreamers who looked inside of this space and saw their future and the possibility of their dreams finally becoming fulfilled. Who were those people? What led them to this place? Were they a married couple, like us, trying to find their way? Or wild spinsters, caught up in a pipe dream? Were they old? Or young? Did they find happiness or success inside these walls? Why were they no longer here, standing on top of the toilet seat, an angled paint brush in hand? If you had asked me back in January, I would have convinced you that the newly constructed space up the street was meant for us. However, now, I'm not quite so sure. After selling our food exclusively at pop-up markets and festivals for nearly two years, the whole reason we finally decided to take the plunge and open up a permanent space was to lay down our roots. 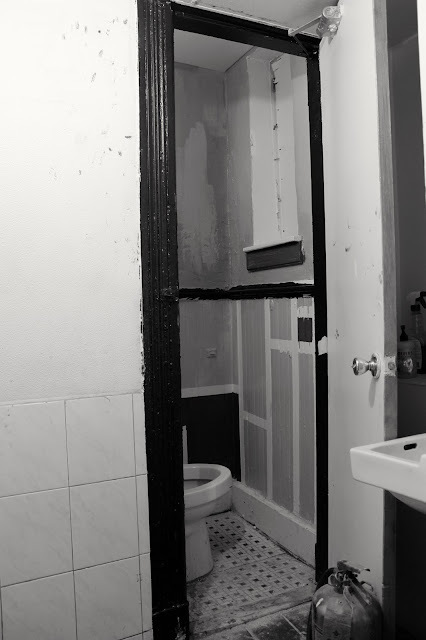 As I stood in that bathroom, admiring my attempts to apply a new layer of paint like so many people had before us, I felt more rooted in this whole venture than I had in a long time. Although some nights, when we realize the never ending to-do list that comes with owning our own business (sooo many errands, so little time), or (on the very bad days) take a glance at our bank account, it is easy to feel a bit lost in this whole venture. However, at that moment, it finally occurred to me that we're not really in this alone. Slowly, we're becoming a part of history -- a history of hopeful and passionate individuals who have come to this crazy, cut-throat and impossibly energizing and inspiring city with not much more than a dollar and a dream. In the end, I have to admit that the bathroom renovation is not entirely perfect. In some spaces, the colors bleed into each other. All those layers of paint prevented smooth coats, and so I should warn you that there are permanent drip marks in some spaces, too. But overall, it looks a little bit better than it did. Or, perhaps more accurately, it looks a little bit more like us. Like our dream, this one we've been working toward these past few years. When I brought the chef in to show him the final product, he seemed pleasantly pleased. "It looks good, but you missed a spot," he said, pointing to the small space on the molding where, a few hours prior, I had been at work with my screwdriver. Once the chef returned to the front of the shop, leaving me with my mini design project, I ultimately decided to leave the unpainted spot alone. If for no other reason, I was tired and I had already resealed the paint cans. However, I also figured those few inches of wall could from time to time serve as a reminder of all the other tenants who came before us. Hopefully, on the days we need it, we will be able to draw a bit of strength or inspiration from their memory. When the week finally came winding to a close, and the bathroom renovation was complete, I began to think about some new recipes to test out. However, I found I couldn't shake my recent thoughts of history. I ended up settling on an upside down cake, a dessert that, to me, feels so nostalgic, one so rooted in American culture and our own sense of shared cultural history. It's an easy dessert for me to imagine my grandmothers serving when they were young women back in the 40s and 50s, one that I can picture my parents eating at backyard picnics when they were kids. This recipe relies on a classic vanilla cake batter and, rather than canned pineapple and maraschino cherries, is given a slight update thanks to wedges of white peaches, plump blueberries and a few fresh lemon verbena leaves. I hope you'll enjoy it. Preheat the oven to 350 degrees. Throughly wash and dry the fruit. Slice the peaches into wedges and set aside. Set a 9-ince cake pan on top of a burner set to low heat. Add 4 tablespoons of butter to the cake pan and allow to melt. Add the brown sugar and lemon verbena leaves and stir gently until the sugar has melted. Turn off the heat, but leave the pan on the burner. In a medium bowl, add the flour, baking powder and salt and gently whisk by hand. In a large bowl, add the remaining butter and sugar and beat on medium speed until light and fluffy. Add the eggs, one at a time, beating well in between each addition. Add the vanilla. Turn the mixer to a low speed and add the dry mixture. Mix until just combined. The batter should be thick. Carefully remove the lemon verbena leaves from the cake pan. Using a rubber spatula, smooth the brown sugar mixture so that the entire bottom of the cake pan is covered with a thin layer. 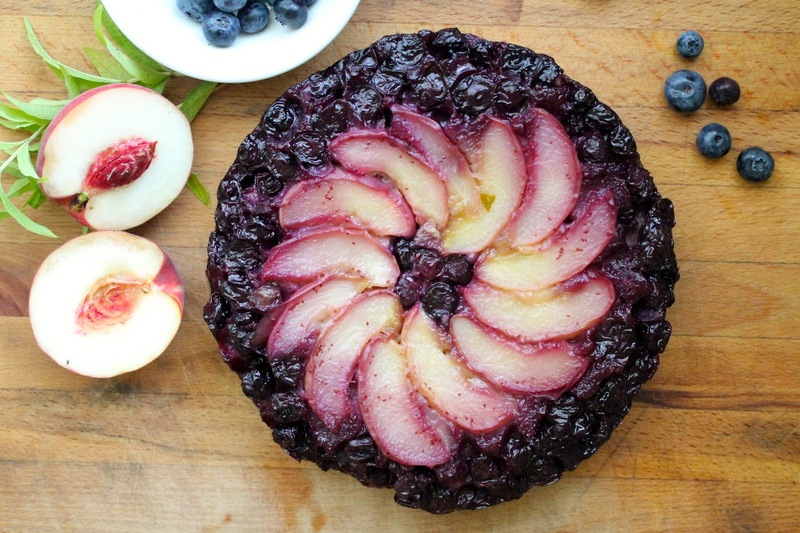 Arrange the fruit in the baking pan, being sure to tightly pack the fruit (keep in mind that the fruit will shrink when cooked). Using an ice cream scoop, dollop the cake batter on top of the fruit. Once all cake batter is on top of the fruit, use a rubber spatula or icing tool to smooth the batter across the cake pan, ensuring that it is spread in an even layer. Bake for 40 minutes. Remove the cake from the oven and allow to cool for only 1-2 minutes. Run a knife around the edges of the cake pan and place a plate over the cake. Very carefully flip the cake pan upside down. The cake should very easily slide out on the plate. Once the cake is on the plate and out of the pan, allow to cool completely so that the fruit continues to set.